When President Rebecca Chopp addressed the Alumni Council in November 2009, she called Swarthmore our “home for life.” Swarthmore constitutes a lifelong community for all alumni and their loved ones—a connectedness that lasts a lifetime, the feeling we get when we meet someone anywhere in the world and learn that they went to Swarthmore. The Alumni Council has begun asking how we can facilitate these connections. Online networks are one solution. They allow participants to remain an active part of the community, continuing associations initiated as students on campus, from anywhere in the world. Affinity groups can also provide alumni with a lifetime of support, mentorship, and discussion. Many Swarthmore affinity groups already exist on Facebook, including those grouped according to class year, international students/alumni, and former members of a capella groups. The council’s initial focus has been on creating groups that focus more on affinity in professional arenas; hence the forum we have used to initiate these affinity communities is LinkedIn, geared toward professional networking. For example: H.G. Chissell ’96 started the Swarthmore Sustainability Network through LinkedIn. Chissell explains why he created the network: “My main motivation for developing the Swarthmore Sustainability Network was to foster a constructive, Swarthmoresque dialogue around an issue that will most likely be the greatest interdependent leadership challenge of human history. After attending the Lax Conference [on Entrepreneurship in 2008, focused on sustainability], which united the Swarthmore community members in attendance around an issue, I was inspired to create the LinkedIn group to provide an ongoing forum for the type of dialogue mentioned above. “Members on LinkedIn each have a professional profile—as opposed to a Facebook-style social profile—that highlights education, work history, and interests as well as talents/skills and connections. Imagine the possibilities when a global Swarthmore forum exists, with members sharing their experiences, ideas, and resources to develop and discuss tangible solutions regarding the many facets of sustainability. Currently with a membership of more than 80, the online group includes jobs, news, and discussion sections. Such groups can effect real change. A current Swarthmore student, who was a member of Good Times 4 Good Food—a student-run organization that works on sustainable food issues in the community through gardening, composting, sustainable food advocacy, and fair food activism—asked Chissell’s network for advice. Many people responded, and the group then sponsored a fundraiser, amassing $250 for Good Times 4 Good Food. Other Alumni Council members have started affinity networks on LinkedIn as models to test the format. Rob Steelman ’92 formed the new Swarthmore Business Network, which now has almost 200 members. Joshua Farber ’02 has created the Swarthmore Legal Network, and Nina Paynter ’97 is working on a Swarthmore Public Health Network. These groups all have different goals in mind—from brainstorming, to mentoring, to creating business connections—and differing audiences (those who have worked for a while and are practicing in their field to those seeking tips for entering into the field). 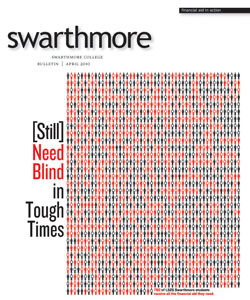 If you don’t see a Swarthmore Network you’d like to be part of, start one yourself!